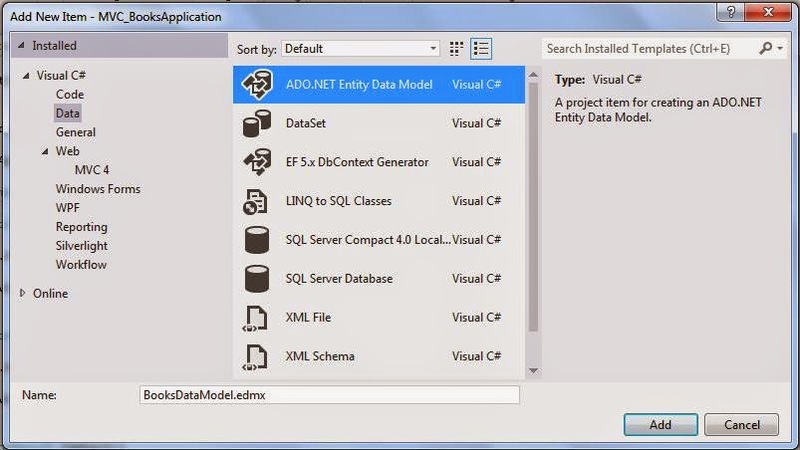 Before start we must be familiar with the terms Entity Framework and ORM(Object Relational Mapping). Microsoft Entity Framework (EF) is an object-relational mapping (ORM) framework that enables developers to work with relational data using domain-specific objects. Or in simple words we can say it is an enhancement to ADO.NET that gives developers an automated mechanism for accessing & storing the data in the database. It enables developers to deal with data as objects and properties. It eliminates the need for most of the data-access code that developers usually need to write. 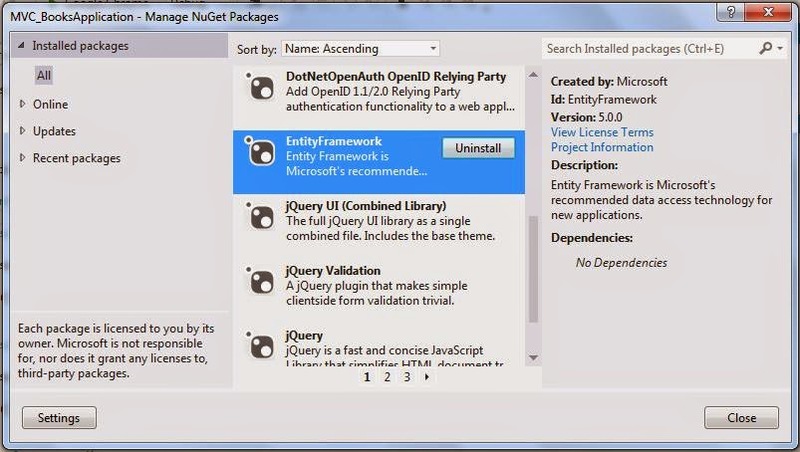 Using the Entity Framework, developers issue queries using LINQ, then retrieve and manipulate data as strongly typed objects. It provides the services like change tracking, identity resolution, lazy loading, and query translation so that developers can focus on their application-specific business logic rather than the data access fundamentals. What is O/RM(Object Relational Mapping)? We perform different kind of operations on data like CRUD (Create, Retrieve, Update, and Delete) operations when working with database driven application. We might be using high level languages which are mostly object oriented like C#, VB.NET or Java, python etc. On the other hand, our databases are mostly relational in nature like MS SQL Server and Oracle. That means we are working with two different and incompatible type systems (i.e. Object Oriented Programming Languages with Relational Databases). So an ORM (Object Relational Mapping) framework provides mapping between these two incompatible systems. It enables us to interact with data in an object oriented way. ORM is used for storing data from domain objects to relational database like MS SQL Server and retrieve them in an automated way. It uses metadata information to interact with database so our data-layer code doesn’t know about the database structure. This makes the application maintainable and extendable. Thus O/RM tool becomes middleware that completely hides the complexity. ORM specifies how a class and its properties are related to one or more tables in the database which is used by the O/RM tool’s engine to dynamically build SQL code that retrieves data and transforms it into objects. 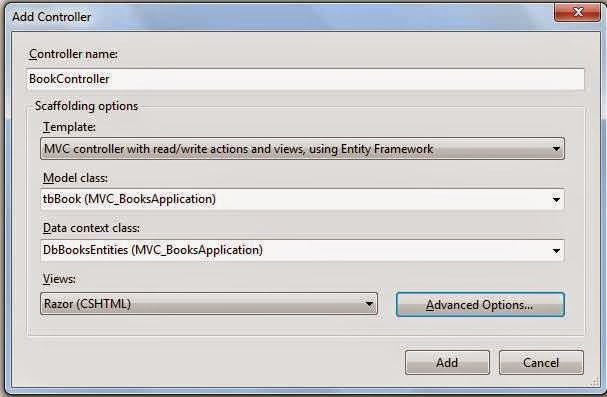 Implementation: Let’s create a sample MVC Book application to perform basic CRUD operation. But first of all create a Sql Server Database and name it "DbBooks" and in this database create a table and name it "tbBooks" . Now we have database and a table with some dummy data. 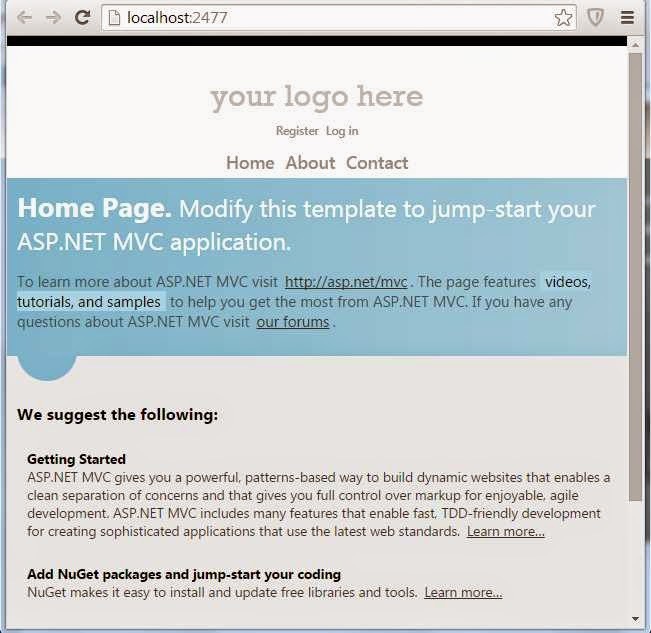 It’s time to create MVC application step by step demonstrating CRUD operations. Step 1: Open Visual Studio 12 or greater. I am using Visual studio 12 for this applications. File Menu -> New project. Select you preferred language either Visual C# or Visual Basic. For this tutorial we will use Visual C#. Name the project “MVC_BooksApplication”. Specify the location where you want to save this project as shown in image below. Click on OK button. 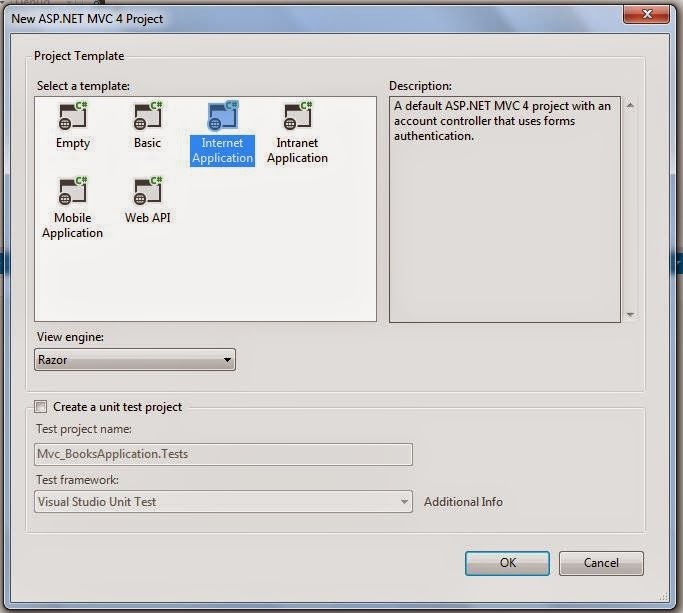 A "New ASP.NET MVC 4" project dialog box having various Project Templates will open. Select Internet template from available templates. Select Razor as view engine as shown in image below. Click on Ok button. Step 2: It will add required files and folder automatically in the solution .So a default running MVC applications is ready. You can run the application using F5 or from the Debug menu of Visual Studio select Start Debugging. As we are using default template, you can see the links to the Home, About and Contact pages as shown in image below. All are functional. 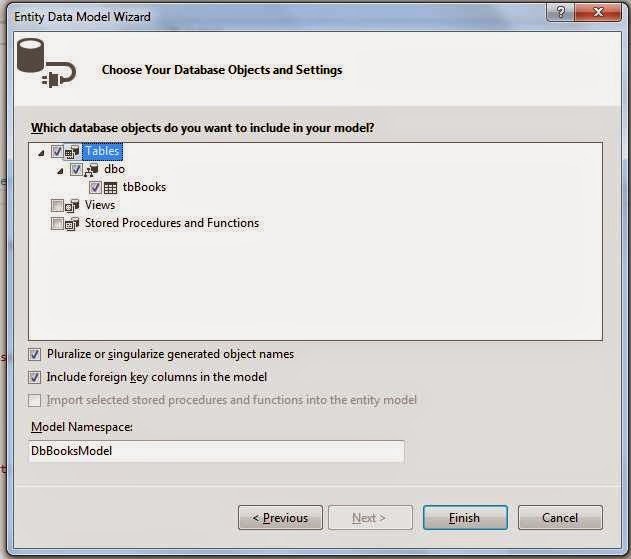 Step 5: Select your database from server as shown in image below. It will automatically create connection string in web.config file with the name "DbBooksEntities" . You can also change the name of the connection string. But leave it as it is. 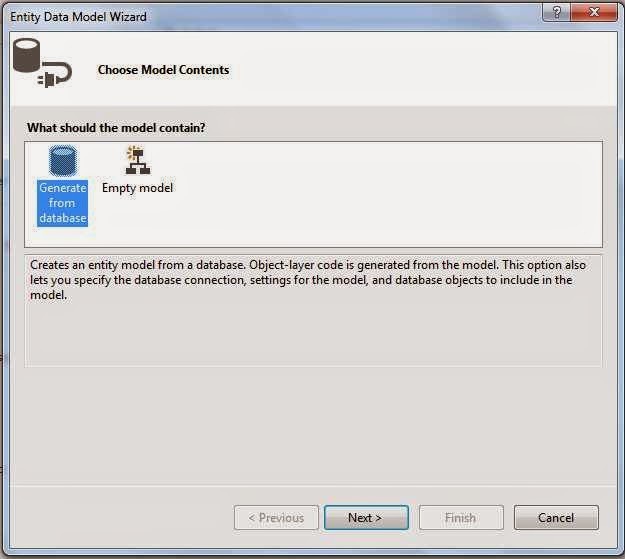 Step 6: Select Database object that you wish to add in the Model as shown in image below. In our case it is "tbBooks" Table. 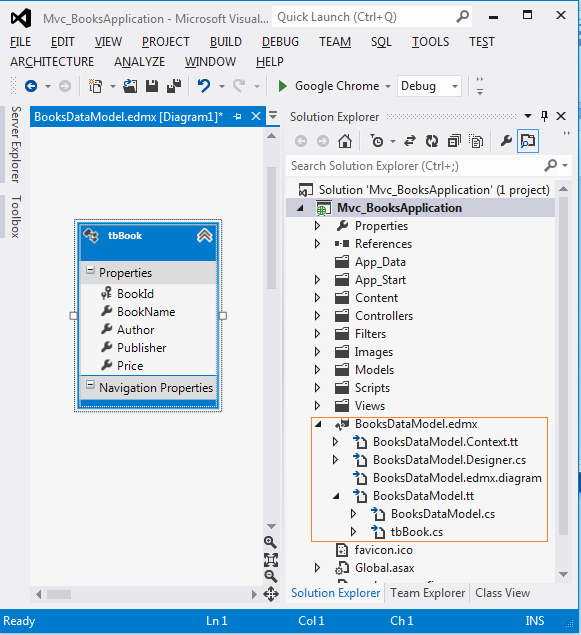 Leave the Model namespace "DbBooksModel" as it is. Now build the solution. Go to Build Menu-> Build Solution. Step 8: Now add a new controller by right clicking on Controller folder in solution explorer -> Add -> Controller and name it BookController. Name the controller as BookController. 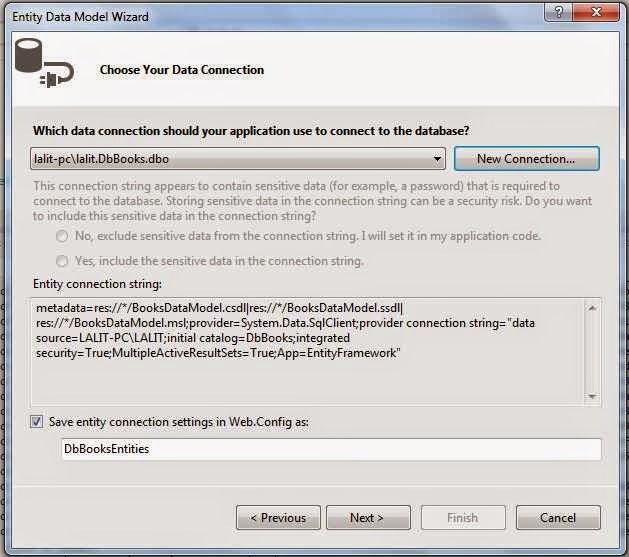 Select Data context class as DbBooksEntities (MVC_BookApplication). Also Click Advanced Options, select layout or master page and then expand Views folder and select _Layout.cshtml from the shared folder. Visual studio will automatically create the following files and folder under your project. A BookController.cs file in the Controllers folder of the project. 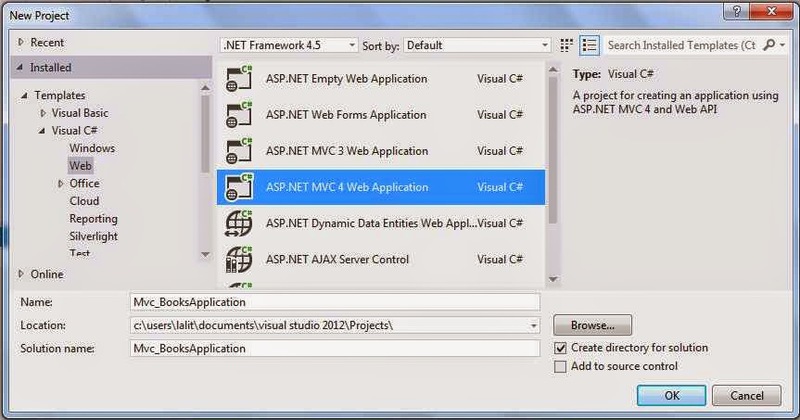 Congrats you have created the MVC application having Create, Read, Update and Delete (CRUD) functionality that the Asp.Net MVC automatically created so the phenomenon of creating CRUD action methods and views automatically is called Scaffolding. Step 12: Now Let’s set our BookController as the default controller and index method as the default action instead of default HomeController’s index method. Now all is set. Just press F5 to run the application and play with the CRUD operation. Thanks for your valuable feedback.Stay connected and keep reading for more updates.